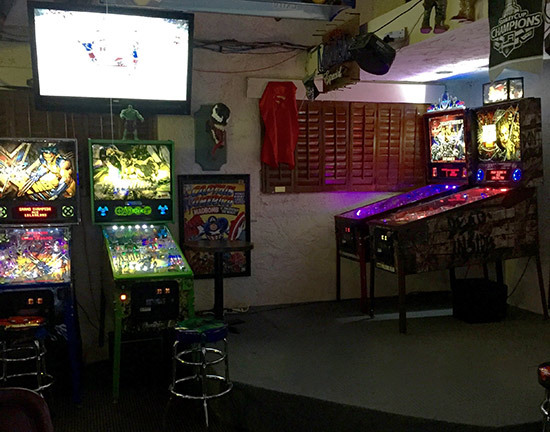 The concept of a 'barcade' seems to be rising in popularity of late. 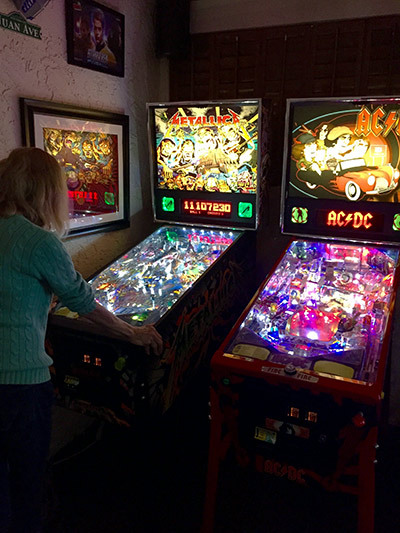 Old school is cool again, and pinball is seeing a major resurgence with new companies and machines being introduced into the scene. The Los Angeles area has not been well represented when it comes to pinball. There have been machines at the Santa Monica Pier, and a few here and there at various bowling alleys and mini golf courses. If you did find a machine, chances are it wasn’t in the best condition. The L.A. area has been underserved when it comes to playing the silver ball. That being said, I was thrilled and amazed when I happened to hear about a local Mexican restaurant/bar in the San Fernando Valley that was supposed to have some nice machines. I took it upon myself to check it out, and lo and behold I was amazed when I did. 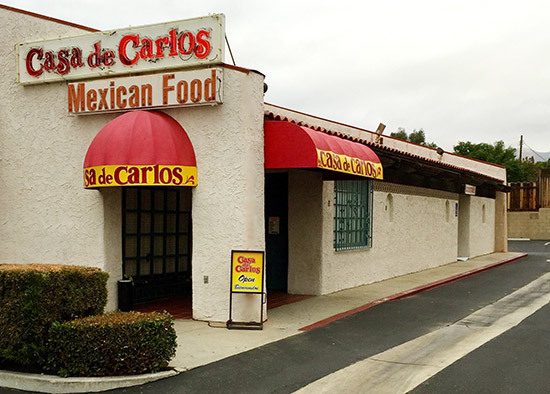 Casa De Carlos is located near the corners of Devonshire and Mason in Chatsworth. It is in the corner of a shopping center and has been there for many years. 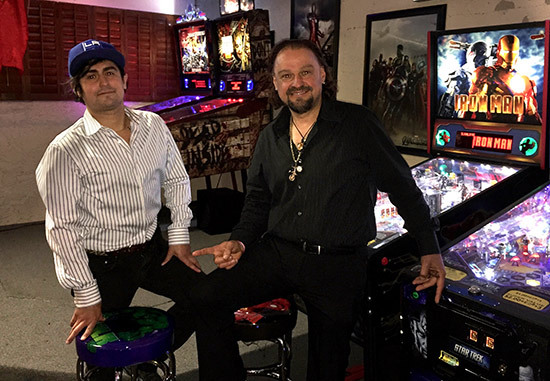 Not long ago, Juan Gomez took over the business, and along with his son, Christian, they have brought top-flight pinball to this establishment. Juan has had a passion for pinball since he was in the fourth grade, and would head over to his local 7-11 store to play as often as he could. As a young man he purchased his first machine - a Williams Grand Lizard - for $475, and hasn’t stopped collecting since. 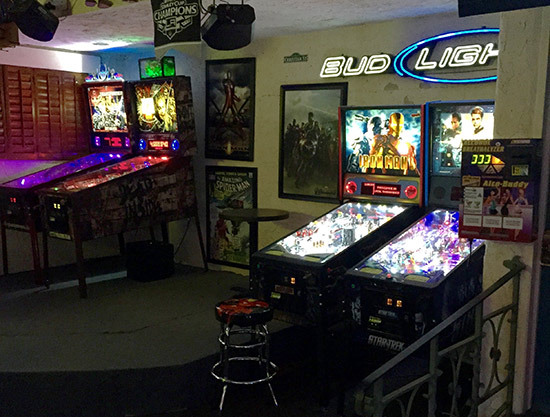 He turned his garage into an arcade in the 1990s after buying machines from a 'container sale' in Long Beach. Back then, he had his choice of dozens of used The Addams Family and other highly prized machines. Having a degree in electronic engineering only enhanced his ability and desire to work with the machines, and he also started collecting jukeboxes. This passion carries on to this day, and he has passed that passion along to his son Christian. It is rare to find a collection of so many fine, new machines available to play in one location. The first time I visited they had a 75th anniversary The Wizard of Oz, Stern's Star Trek, Metallica, AC/DC Luci, The Walking Dead, X-Men, Spider-Man, Transformers, and Iron Man Vault Edition running. I couldn’t believe it! All the machines are in top shape and are located in the bar area of the restaurant. There is also a pool table, a jukebox, and a crane game, with bar top video games also available. Juan also pointed out that he just brought in California Lottery scratchers and Lotto for the adults as well. Juan has a great passion for pinball and continues to add to his collection. He brings games in and out of Casa de Carlos from his personal collection. The night I visited, he had just ordered the new Stern Kiss machine, and has a The Hobbit and The Big Lebowski on order as well. Christian mentioned that they have one of the new Medieval Madness machines on order too! Some of his older machines have been upgraded with LEDs and he rotates those in on occasion. All are in top working order. The normal charge is $1.00 for 3 balls, with 3 games for $2.00. However, on Wednesday nights from 8-10pm they set the games to free play, and do the same on Saturday evenings from 10pm to midnight! They are open every day from 11am and the machines are available to play all day. Juan told me that he wants his place to be sort of a “Chuck E Cheese for adults”. The atmosphere is very friendly, there are big screens all around the bar area, and they have 18 different beers on tap. It is Juan’s hope that the Los Angeles area would get a pinball show similar to the one held up in the Bay Area every year. If you are looking for a great place to spend some time playing the finest new machines, you will be hard-pressed to find a better location than Casa De Carlos.